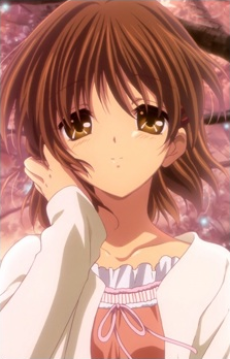 Nagisa is the main heroine of Clannad, and the daughter of Akio and Sanae Furukawa. Though she is in her senior year, Nagisa is one year older than her classmates; she had to repeat her third year again after an illness that lasted nine months. Nagisa meets Tomoya on the first day of this year. Nagisa is very timid, and has a habit of saying the names of food that she wants to eat as a way of motivating herself. She wants to reestablish the suspended Theater Club, but does not have enough self-confidence to do so. Nagisa begins dating Tomoya, and the couple are married soon afterwards. Nagisa becomes pregnant with Ushio - unfortunately, due to her weak body, she passes away shortly after childbirth. In the true ending of After Story, Nagisa survives, and lives together with Tomoya and Ushio.